The idea for the Lee relief was inspired by the famous Mathew Brady photograph taken of Lee three days after his surrender to General Grant at Appomattox. The photo was taken as Lee stood on the front porch of the home he and his wife were staying at in Richmond, Virginia. This relief of General Robert E. Lee was sculpted in clay, and a mold was then made from it. The relief sculpture then cast in three mediums - cold cast Bronze, bonded Pecan wood and bonded White Marble. "After four years of arduous service marked by courage and fortitude, the Army of Northern Virginia has been compelled to yield to overwhelming numbers and resources. I need not tell the brave survivors of so many hard fought battles who have remained steadfast to the last that I have consented to this result from no distrust of them; but feeling that valour and devotion could accomplish nothing that could compensate for the loss that must have attended the continuance of the contest, I determined to avoid the useless sacrifice of those whose past services have endeared them to their countrymen. Each relief is mounted on solid Walnut which can be mounted on the wall or stood in a tripod as in the photograph. 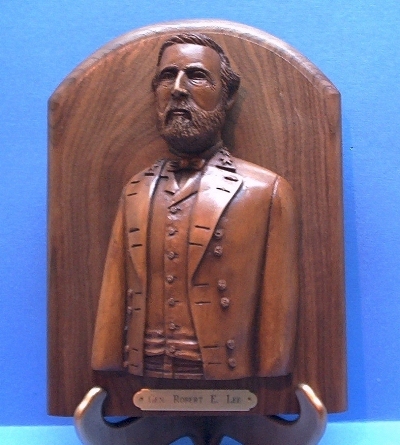 The piece is 7 1/2 inches wide X 10 inches tall and has a brass nameplate which reads Gen. Robert E. Lee.